Link between campaign and unhealthy food is misleading, brand argues. McDonald’s has defended its long-running Monopoly promotion after a blistering attack from Labour deputy leader Tom Watson, who has positioned himself as a crusader against unhealthy food and drink. 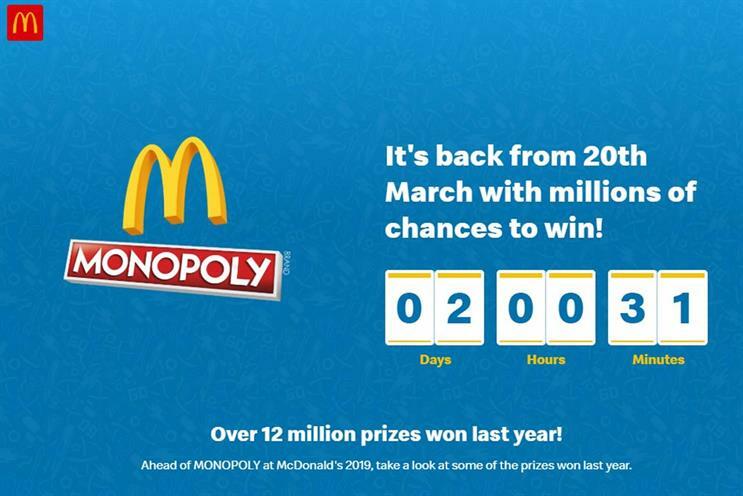 Writing to McDonald’s UK chief executive Paul Pomroy, Watson called the activity, which offers customers the chance to win freebies including fries and drinks, a "grotesque marketing strategy" and "a danger to public health". McDonald’s said it had made a series of changes to the promotion, now in its 14th year, that reduced the incentive to consume additional foods high in fat, salt or sugar. These included offering the same number of prize labels in medium and large meals, thus removing the incentive to "go large". It is also offering prize labels on healthier options, including carrot bags, salads and Big Flavour Wraps, and prizes come with a choice of product. A spokeswoman said: "Customer choice is at the heart of everything we do, including our popular Monopoly promotion in which we offer our customers a choice between food prizes – for example, a Fruit Bag or McFlurry, and Shaker Side Salad or small fries. "Nutrition information is clearly displayed online, on our app, in restaurant and across our packaging and we continue to review, refine and reformulate our menu to reduce saturated fat, salt and sugar."